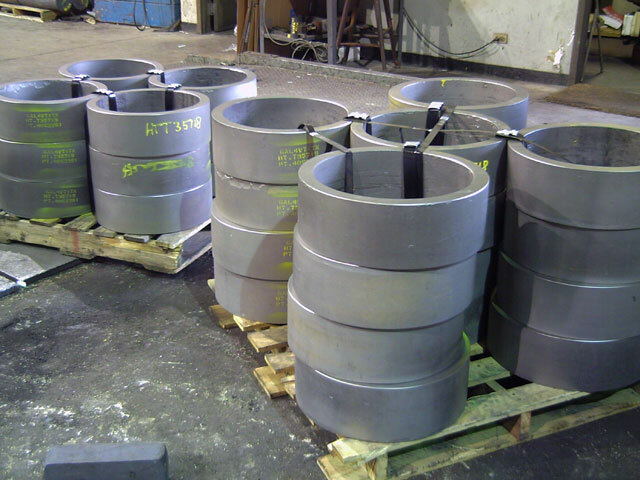 Aluminum forgings from Anderson Shumaker are available in many grades of aluminum. With Anderson Shumaker’s extensive expertise in producing aluminum open die forgings and aluminum forged parts, we can produce the size you need, whether it’s one piece or a large production run. Aluminum rings, hubs, discs, round bars, flat bars, step shafts, and blocks can all be forged by our skilled craftsmen, allowing you to buy the shape you need. Size of aluminum forgings vary by shapes. Our aluminum open die forging feature: no tooling, quick turnaround time & runs from one piece to thousands. Aluminum open die forgings are ideal for applications where a lighter-weight metal is needed. This includes situations with harsh environments or require faster speeds and energy efficiency. For example, aerospace parts and machine components that experience high pressures. Race-car wheels are another common application that benefit from the performance and features of aluminum forgings. They offer maximum impact strength, superior internal integrity and eliminate internal voids as compared to castings. Our value added operations include: heat treating, physical testing, non-destructive testing, rough machining and finish machining. Contact Anderson Shumaker for aluminum forging today!